The newest most advanced vacuum power brake system available for 66-77 Broncos. NEW! WILD HORSES new MOAB vacuum boost power brake system takes the early Bronco power brake kit to the ultimate level. We left no stone unturned in the design of this system. It can be used as a stand alone kit or in conjunction with any of the front and rear drum or disc brake options we offer. High end precision components make up the MOAB starting with the firewall mounting bracket (zero fender modifications required) then a full size Bendix style dual diaphragm vacuum booster. These units are very much like the stock 76-77 Bronco boosters. 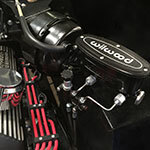 Next we attach a new Wilwood Tandem Aluminum master cylinder. 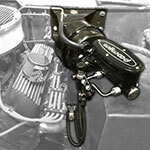 Stainless steel hard lines and a prop valve drop bracket tie the adjustable proportioning valve into the side of the master cylinder. From there we use stainless steel braided precision made flexible hoses which go into our custom stainless steel frame bracket. The frame bracket holds the flexible hoses in the perfect location to allow installation into the existing stock hard lines on the frame with no adapters. If you have a 1966 Bronco with the original single reservoir master cylinder or the 1976-1977 you will need some additional stainless hard lines. Be sure to choose the correct year for your application. 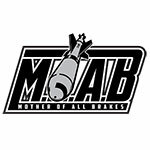 The MOAB is a system worthy of todays custom builds. Installed this weekend. Went together perfectly. Easy install. Looks likes million bucks! I cant wait to drive my Bronco and test these brakes.